An international project which first detected gravitational waves is to receive a funding boost of more than £25 million. The Laser Interferometer Gravitational-Wave Observatory (Ligo), which has two facilities in the US, will undergo an upgrade to improve the sensitivity of its instruments. Scientists will be able to survey more of deep space as a result and expect to see a significant increase in the number and strength of their detections from 2024. 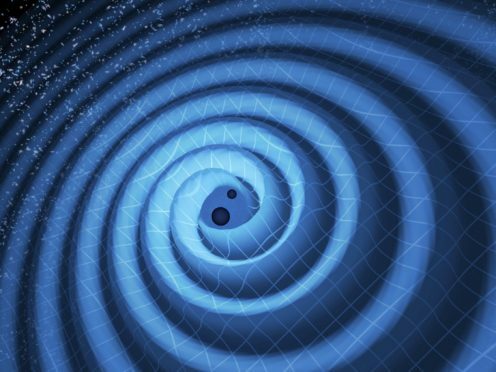 Researchers from the University of Glasgow are among those involved in the project, which made history in 2015 when it first detected ripples in spacetime known as gravitational waves. The phenomena, predicted by Albert Einstein in 1916, are generated by cataclysmic cosmic events, such as collisions between black holes or super-dense neutron stars, or massive stellar explosions. Professor Sheila Rowan, from the University of Glasgow, said: “In the three years since Ligo’s first detection of gravitational waves, we’ve observed a remarkable string of cosmic events, including a series of black hole collisions and a neutron star merger, the majority of which would have gone unnoticed here on Earth without the advent of gravitational wave astronomy. “This announcement of new funding for Advanced Ligo Plus ensures that we’ll continue to build on these strong foundations by making the detectors even more sensitive to the vibrations of spacetime. The Ligo facility is made up of two pipes which form an L shape, laser beams and mirrors, which can detect gravitational waves as they reach Earth. The upgrade, known as Advanced Ligo Plus, will be aided by more than £10 million from UK Research and Innovation.